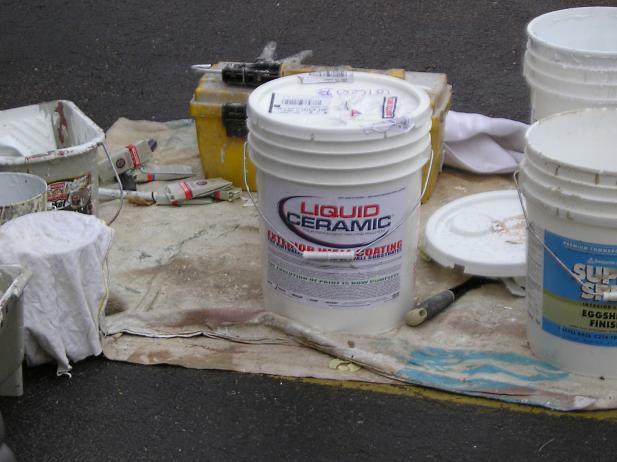 Estimating Paint or Stain - How Much Do You Really Need? Home / / Estimating Paint or Stain How Much Do You Really Need? 5 gallon paint bucket and assorted painting tools. It’s smart to estimate how much exterior paint or stain you’ll need before you even head to the store. It’s virtually impossible to get two cans of paint the exact same color- even if the same color formula is used. Using two cans mixed at different times can result in obvious color differences. Mixing all your paint together helps ensure uniform distribution of pigment- but you don’t have that luxury unless you buy enough paint in the very beginning! Transparent and semi-transparent stains are more forgiving, but the last thing you want to do in the middle of your project is head back out because you’re out of product! Many formulas recommend measuring each wall separately, determining their square footage, and then adding all the measurements together. This idea works great for interior walls but not so well for exterior surfaces where the roughness or porosity will increase the amount of paint or stain needed. Round up; it’s better to buy too much paint than not enough. Each side of your home needs a separate measurement and total square footage. Measure the length then the highest point in feet. Multiply these together for a total square footage, repeat for each side. If you have huge picture windows or multiple doors, you can subtract their square footage- but, again, you’ll want a little extra paint on hand to allow for application loss and touch-ups. This will give you a good accurate square foot total for estimating exterior paint, primer or stain. For decks and other unusually shaped projects, you’ll need to determine square footage of each paintable surface individually, and then add these measurements together. Write it all down, and label each measurement: “deck floor,” “hand rail,” “lattice-left side,” etc. This ensures you won’t miss anything. Don’t forget to double-check your math, too; the more calculations you have to make, the greater the chance that you’ll make a mistake- even with a calculator! For any smooth surface the square footage is increased. Many rough surfaces will require either multiple coats or thicker coats to achieve a finished look. Rough Stucco- 200 sq.ft/gallon maximum. Rough sawn lumber- 200-250 sq.ft/gallon after priming. Smooth metal garage door- 300-400 sq.ft/gallon. Another consideration is application method. A general rule is spraying will take 20% more paint or stain than brushing and rolling. Always buy more paint than you think you’ll need. Some waste is inevitable in the form of spilling, overspray, and the little bit that’s always left over in the can. Paint and stain are more economical in large quantities; if you’ll need four gallons, but the five gallon bucket is cheaper than buying four one-gallon containers, go for it. You’ll probably need some for touch-ups anyway or you could use the excess for another project, like painting a shed. One thing to remember is that contaminated paint and stain don’t store well. Always pour the product into a paint tray or another container, instead of working directly out of the can. And, store leftover paint and stain in the smallest possible container to prevent hardening. Paint stores carry empty paint buckets that are perfect for this. Label cans with a dab of the paint inside them to make it easy to find the right color when you need it. Seal paint and stain cans carefully and always keep them well out of reach of children.